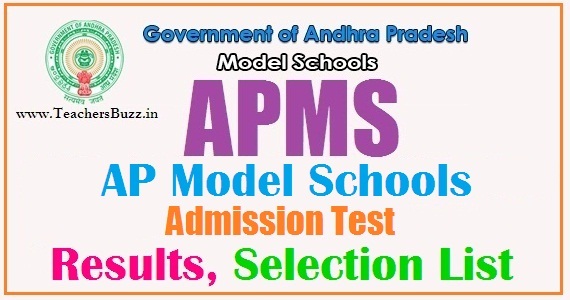 APPECET 2019 ( Andhra Pradesh Physical Education Common Entrance Test) Notification, Schedule ,Application Form, Eligibility, Exam Dates, apply Online @ sche.ap.gov.in ANU APPECET Physical Education Entrance Test 2019: Online #AP #PECET 2019/AP#BPEd #DPEd Entrance Test 2019: Andhra Pradesh PECET 2019 is a Common Entrance Test as Physical Education Common Entrance Test (PECET-2019) and its schedule would be released in February and the detailed notification released in March 2019. This test will be conducted by the Convener, PECET 2019, Department of Physical Education, Acharya Nagarjuna University, Guntur for the academic year 2019-2020. Beginning from this academic year, Bachelor of Physical Education will be a two (2) year course. In the post, candidates have been offered the details about the AP PECET 2019 and additional information about the Application Form, Eligibility Criteria, and Admit Card & Important Dates etc. Candidates can get all the details of AP PECET 2019 from this page given below.This year entrance test woud be conducted on 4th May 2019 at various centres in the Andhra Pradesh state effectively. 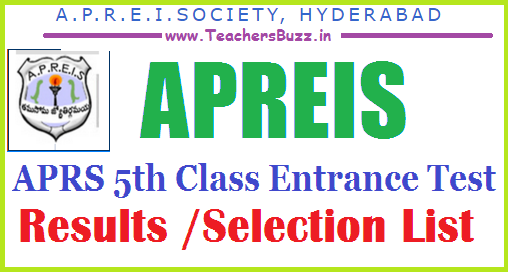 AP PECET 2019 Results | Physical Education B.P.Ed, U.G.D.P.Ed Entrance Test 2019 Results ,AP PECET 2019 Results Physical Education entrance 2019 Results appecet.org.in, AP Physical Education Entrance Test 2019 Results/Rank cards. A Common Entrance Test designated as Andhra Pradesh Physical Education Common Entrance Test (APPECET - 2019) will be conducted by Acharya Nagarjuna University for the academic year 2019-2020 for seeking Admission into B.P.Ed. (2 Years) and U.G.D.P.Ed(2 Years) Courses. The Application form is for Common Entrance Test for the entry into the Physical Education courses. a. For B.P.Ed: Candidates should have appeared or passed three year degree examination recognized by any university in A.P. or any other university recognized as equivalent thereto and should have completed 19 years of age on 01.07.2019.
b. For U.G.D.P.Ed: Candidates should have appeared or passed Intermediate or equivalent course recognized by the Government of Andhra Pradesh and should have completed 16 years of age on 01.07.2019. AP PECET 2019 Entrance Test successfully conducted from 2019 and they are waiting for their results. These results of PECET has been released and it has been placed on its official web portal http://www.appecet.org.in/ . Appeared candidates can get the results from here. Board of Intermediate Examinations(IPE) AP Hyderabad has been decided to conduct Intermediate Advanced Supplementary Examinations in May 2019. So, the Schedule has been prepared by BIE AP,Hyd . The schedule of Intermediate Advanced Supplementary Examinations May 2019 released on April 2019 by the Board of Intermediate Education, A.P., Hyderabad. 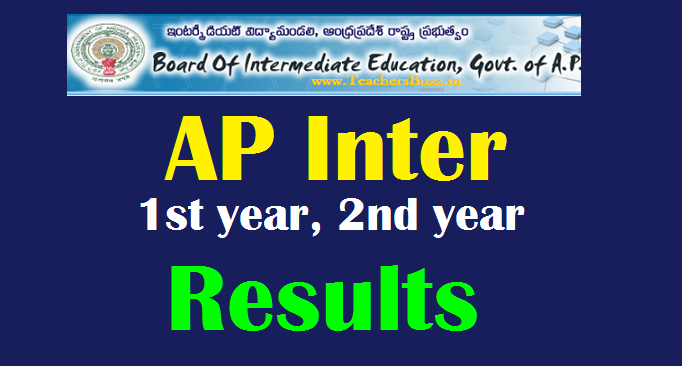 Board of Intermediate Education Andhra Pradesh on Thursday released the intermediate examination results for both first and second year general and vocational courses. Those who have got compartment, can apply for the supplementary examination scheduled to be held from 14th May 2019 to 22nd May 2019. The last date to pay the fee is 24 April. The last date to apply for recounting, the re-verification process is 22 April. The students have to apply through online. The exams for Inter first year will be held from morning 9 am to 12 pm. From afternoon 2:30 pm to 5:30 pm the second year exams will be conducted. The results for the intermediate first and second year were released on 12 April. The Board will conduct the practical exams from May 23 to 27, 2019. The students who are unhappy with their marks, can apply for re-verification or scanned answer sheets by paying Rs 200 for Recounting and Rs.1000 for Re-verification upto April 22. The last date to submit exam fees is April 24, 2019. The 60 per cent of candidates passed in the first year, and 71% is the passing percentage in the second year results. For the inter exams a total of 9.65 lakhs candidates have appeared out of which 6.3 lakhs students passed out. The remaining 3.3 lakhs candidates have failed in the exams. b) Environmental Education Examination on 29-05-2019 from 10.00 A M to 1.00 PM (One day). GEOGRAPHY PAPER-I MODERN LANGUAGE PAPER-II. 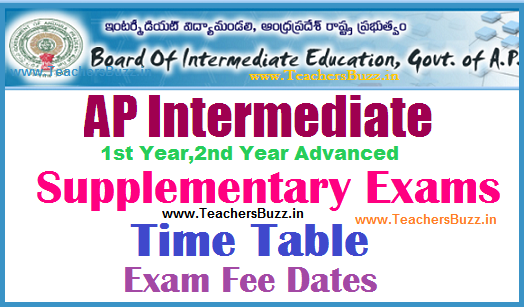 Tags: BIE AP IPE Inter Supplementary Exams May 2019 TimeTable Schedule, AP Inter Supplementary Exams 2019 AP Inter Supplementary Exams Andhra Pradesh Inter Supplementary Exams AP Inter 2019 bieap.gov.in, Inter First and Second Year Supplementary Exams 2019 Table Download, BIE AP Inter 1st First Year May 2019 Time Table, BIE AP Inter 2nd Second Year May 2019 Time Table. Board of Intermediate Examinations(IPE) TS Hyderabad has been decided to conduct Intermediate Advanced Supplementary Examinations in May 2019. So, the Schedule of Intermediate Advanced Supplementary Examinations May 2019 has been prepared by BIE Telangana ,Hyd . to be released on 18th April 2019. Board of Intermediate Education Telangana on Sunday released the intermediate examination results for both first and second year general and vocational courses. This year, over 10 lakh students appeared for the Intermediate examinations. First year per cent is Percent. Second year pass percent is per cent. Those who have got compartment, can apply for the supplementary examination scheduled to be held from 16th May 2019 to 27th May 2019.
a. వచ్చేనెల 16 నుంచి అడ్వాన్స్డ్ సప్లిమెంటరీ పరీక్షలు నిర్వహిస్తామని ఇంటర్ బోర్డు కార్యదర్శి అశోక్ కుమార్ తెలిపారు. c. హ్యూమన్ వాల్యూస్ పరీక్ష June 01న, పర్యావరణ విద్య పరీక్ష June 03 న నిర్వహించనున్నట్టు చెప్పారు. d. ఈ నెల 25లోగా ఫీజు చెల్లించాలని సూచించారు. e. రూ.100 తో ఒక పేపర్ లీకౌంటింగ్ చేయడం చుకోవచ్చని, రూ.600 తో జవాబు పత్రాల జిరాక్స్ కాపీలను పొందవచ్చని చెప్పారు. f. దీనికి ఈ నెల 19 నుంచి 25లోగా దరఖాస్తు చేసుకోవాలని సూచించారు. 1. Exam Dates: The supplementary examination for first and second-year intermediate students will be conducted from May 16 to May 27, 2019. 3. Marks Memo / Marks sheet: Students can meanwhile collect their mark sheets from their respective colleges from April 18, 2019. The practical tests would be held from May 28 to May 31 . Advance Supplementary Inter Exams From May 16th: The Board exams for intermediate students, on 18th April the results were released as usual the girls were toppers. A training program to be conducted to the inter supplementary students. 2. Fee for vocational course is Rs.400/- and also pay extra Rs.150/- for each subject. The supplementary examination for first and second-year intermediate students will be conducted from 16th May 2019 to 27th May 2019.
the last date for payment of examinations fee is 25th April 2019. Marks Memo / Marks sheet: Students can meanwhile collect their mark sheets from their respective colleges from April 18, 2019..
b) Ethics & Human Values Examination on 01-06-2019 from 10.00 A.M to 1.00 P.M. (One day). మార్కుల పునఃపరిశీలనతో పాటు స్కాన్ చేసిన జవాబుపత్రం పొందేందుకు ఒక్కో సబ్జెక్టుకు రూ. 600 చెల్లించాలి. నిపుణులు మరోసారి పరిశీలించి మీ Mail కు మీ జవాబుపత్రాన్ని పంపిస్తారు. కేవలం మార్కుల పునఃలె క్కింపు కోసమైతే ఒక్కో సబ్జెక్టుకు రూ. 100 చెల్లిస్తే చాలు. అప్పుడు మార్కుల లెక్కింపులో ఏమైనా పొరపాటు జరిగిందో లేదో చూస్తారు. ఏమైనా కూడికలో తేడా ఉంటే సరిచేసి తాజా మార్కులను పంపిస్తారు. వీటికి ఈనెల 19వ తేదీ నుంచి 25వ తేదీ మధ్య రుసుం చెల్లించాలి. ఆసక్తి గల విద్యార్థులు తెలంగాణ ఇంటర్ బోర్డు వెబ్ సైట్ ద్వారా దరఖాస్తు చేసుకోవాలి. వారు bie.telangana.gov.inలో లాగిన్ కావాలి. అందులో స్టూడెంట్ ఆన్ లైన్ సర్వీసెస్ లోకి వెళ్లి దరఖాస్తు చేసుకోవచ్చు. 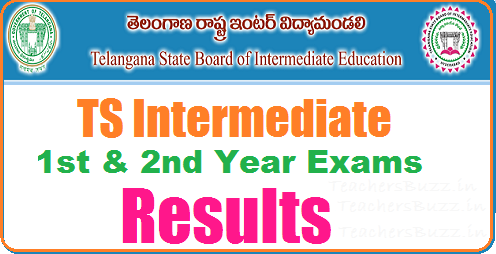 The Telangana State Board of Intermediate Education (Telangana BIE) released the 'Inter First and Second Year General and Vocational Results 2019' results on 18th April 2019 Now, the board has opened the window for the revaluation/re-verification and recounting of the answer sheets. Revaluation and Recounting process: Moreover, the revaluation and recounting process will be opened from April 16 till April 20. According to reports, this year, nearly 9.4 lakh candidates appeared for the examination at various test centres across the state.